FriendGrief: How Can You Tell Who The Friends Are? I remember sitting in the funeral parlor for my uncle’s wake. He’d died in a car accident less than two weeks before Christmas, and we were in shock. There would be no Christmas that year, not really. But first we had to get through the wake and funeral. I sat there with my sister and cousin as the funeral directors brought in the flower deliveries. It soon became apparent – at least to us – who knew my uncle and how well. He and I shared a hatred of gladiolas (and no, you can’t change my opinion on this). They exist only for funerals, in my mind, and depress me just thinking about them. It seemed everyone he worked with who sent flowers, sent gladiolas. “They don’t know him,” we’d say smugly. Now and then, an arrangement with bird of paradise, his favorite flower, would arrive. And we knew the people who sent them really knew him well. Years later, when the funeral ends in the film The Big Chill, Karen plays “You Can’t Always Get What You Want” for the recessional. His friends understood not only that it as Alex’s favorite song, but probably had specific memories related to it. His family may have not even known it was his favorite. Family have been with us since the beginning, but friends are with us most of the way. Don’t be surprised if you know things about your friend that their family never suspected (good and bad). Share them: with other friends and with the family. In times of grief, stories of happier times and the assurance that their loved one was loved can make a world of difference. 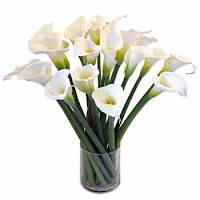 And just in case you want to know, I prefer calla lilies. I do love gladiolas, but calla lilies are my favorite and I chose them for my wedding bouquet. Sometimes, we show different sides of ourselves to various people in our lives, and it is interesting when those pieces somehow come together. During my grandfather's viewing, this elderly lady with snug jeans, big jewelry, and a lot of makeup came in and kneeled over his casket, gripped his hand, and cried out "Pedro...I miss your laugh." She went on, talking about his dancing, his good looks, his boisterous, unforgettable laugh, and then concluded," We'll always have '69." It still intrigues me about the mysteries we are...vast, uncharted terrains even to ourselves. And with all I knew about my grandfather, how much did I really know about what made him tick? Thanks for the laugh, Jennifer! What a great story! Thanks for sharing it. And by the way, my wedding bouquet was calla lilies, too. What an intriguing thought that we can learn about our loved one's through others. I never knew that my Dad was fascinated by house plans and wished he had been an accountant(he was a mechanical engineer) until my husband told me after a discussion they had before he died last year. Also I never really thought about what flowers I wanted- think I'll go for sunflowers and black-eyed susans. They are wild and free and beautiful and remind me of the garden. Great post and discussion,Viki. Love Jennifer's story.